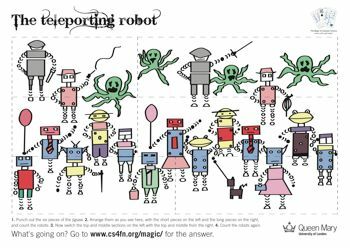 You introduce a simple jigsaw (download it here) showing 17 robots (together with a few marauding Hexapi monsters). You collect the six pieces of the jigsaw in your cupped hands and concentrate. Your mind power will send one of the robots into another dimension, teleporting it to a distant unseen location. To prove your psychic blast has in fact done what you say, you reassemble the jigsaw. You and the spectators count the robots again. As you reach the higher numbers the amazement spreads through your audience. It's the same jigsaw as before but only 16 robots remain. Number 17 has vanished leaving no trace! This amazing effect works through a combination of geometry and an error in the way people see. Look at the complete jigsaw. There are clearly 17 robots. Cut out the pieces. You are now going to rearrange them in a different order. The bottom two pieces go together as they did in the original, but you swap the position of the top two and middle two bits. What were originally the top left pieces are now top right and vice versa. Look at this new jigsaw. Count the robots. There are only 16 now. You've fooled yourself! Error!!! Can't Compute! Who needs more proof! It disappeared before your eyes! Where did number 17 go? How can just swapping the top two pieces make a whole robot vanish? The secret is called distributed concealment. Look at the picture of coloured lines on the right. There are 5 vertical lines. Now imagine you cut those lines on a diagonal and slide the resulting top triangle along by one line space, the result is 4 lines. Where did the extra line go? It can't just have vanished can it? No, what's happened is that the remaining lines are all a little bit longer. We've made it really obvious here by only using a few lines. The more lines the harder it is to spot. Bits of the missing line have been added to each of the remaining lines. The 'vanish' is caused by spreading parts of the vanished object over lots of different locations. That's what distributed concealment is about. Why don't we spot it? Well, people aren't that good at accurately judging lengths by eye. The remaining lines look 'about the same' as before. About, yes, but the same, no! That's why we invented rulers! The jigsaw is based on the above simple geometric vanish. The 16 robots left are all just that little bit longer and we make the mistake of not noticing this. Bits of each have been recycled into others to create a series of new, larger robots. Each loses a small bit (a part of a head say) and gains a bigger new version (a bigger head bit from someone else). The jigsaw design is more cunning than the lines though. Rather than just having the robots in order, where a simple slide of the top section would make the remaining robots taller, the jigsaw design cleverly weaves the geometric vanish into different parts of the picture. We've used an extra layer of concealment, another way to throw the audience. The top two pieces throw in yet more confusion - those top 4 robots move around, but do not otherwise change. All you have to do is correctly assemble the jigsaw in the first instance to show 13. Then, after you have collected the pieces, reassemble it in the order that shows only 12. Your spectators wont remember the exact order. Note to make it easier there are tiny dots on the top two pieces, join the dots together for the first 13 robot picture, and then keep them apart for the 12 robot finale. Like the changes in size the small dots won't be noticed! Build a patter about how now robots are with us we are going to have to keep an eye on them. As with WALL-E they have a tendency to disappear on their own little excursions, once they start to develop minds of their own. Alternatively, you can worry about whether a Hexapus has eaten it...or did it teleport in time. Play up the count - make your audience count the robots out loud, one by one with you. Do it both before and after reassembly! You could even write the resulting number 17 on a board where all can see and so no one can accuse you later of trickery. Why not print off and cut out the robot sheet. You can then give your audience a bit of your magic to take away at the end as a reminder of your show, and of the Magic of Computer Science!